Pexio Bypass Pruning Shears Review 2019: A Must-Have Gardening Tool? A pair of quality pruning shears is a must-have for any green thumb. This handy little tool makes pruning and cutting through small branches a piece of cake. A pair of good pruning shears will be able to cut through at least half an inch of a plant in diameter with absolute ease. Pruning shears are also very commonly referred to as clippers, pruners, or secateurs. The market is flooded with several types, kinds, and styles of pruning shears. For a person who has never owned one before, it can get extremely confusing to select one. So, to make things easy for you, allow to introduce to you one that might very well be the perfect pruning shears for you—the Pexio Bypass Pruning Shears. If you are on the lookout for a pair of pruning shears that will be able to withstand all of the environmental abuse and yet will not fail on you by corroding or rusting, then the Pexio Bypass Pruning Shears is the product that you need. The Pexio Pruning Shears are available in two types: bypass and anvil. Today, we are only going to focus on the bypass pruning shears. This tool comes in a bright red color and weighs about 9.6 ounces. It measures 11 by 4 by 1.5 inches, which is just the right size for most people with regular-sized hands. Pexio is a brand that is known to offer only some of the best and highest quality products, and this pair of pruning shears is no different. It lives up to the same high standards as the expensive pruning shears from other brands. However, this one won’t cause a hole in your pocket. It comes equipped with a high-quality, premium titanium steel blade that also features an ultra-fine polishing, which prevents the blades from ever getting corroded. This feature alone makes buying this pair of shears worth the price. The titanium steel blades are not only strong and reliable but also lightweight and sharp enough to perform exceptionally well. It features a sap groove design that keeps the blades from sticking together by keeping the sap away from it. In addition, it also boasts ergonomic handles that feature a non-slip technology, making this pair of shears very easy and safe to use. These handles are also known to support a secure yet comfortable grip. What takes the cake for this product is the fact that the company provides you with a lifetime warranty on their pruning shears in order to safeguard your purchase. In fact, they offer an instant replacement when you send in a request along with a couple of pictures of your broken pruning shears. However, we can assure you that it is very unlikely you will have a pair of broken pruning shears unless there is a manufacturing defect. The Pexio Bypass Pruning Shears is a heavy-duty gardening tool that would be an excellent addition to any gardener’s arsenal. It is equipped with quality springs that reduce fatigue on the hands as well as titanium steel blades that deliver precise and clean cuts. In addition, these pruning shears are also integrated with a wire notch that adds not only convenience but also safety. The sap groove feature helps keep debris away from the equipment as much as possible. Finally, this tool also comes with a lifetime warranty, securing your investment for years to come. A quick search online would show you several different kinds of pruning shears with almost the same features and functionalities. In order to help you with search, we decided to compare the Pexio Bypass Pruning Shears with a similar product so you can clearly see which one is better for you. Here, we take a close look at the Vivosun Gardening Hand Pruning Shears . Even on the surface, these two pruning shears look very different from each other. While they were designed for the same purpose, they have differences in terms of the features that come with them. For starters, they vary in length. The Pexio Bypass Pruning Shears is about 11 inches long, while its counterpart only spans nine inches long. Though that may be a small difference, it would mean the world for those who have smaller hands. The biggest difference between the two is the fact that the one from Pexio is equipped with better, stronger blades—premium titanium steel blades to be exact. On the other hand, the one from Vivosun, although made of stainless steel, is not very long-lasting compared to premium titanium steel. Lastly, and quite more importantly, Vivosun does not offer any warranty as compared to the lifetime warranty that Pexio offers. This just goes to show that, all in all, the Pexio Bypass Pruning Shears is the better investment. 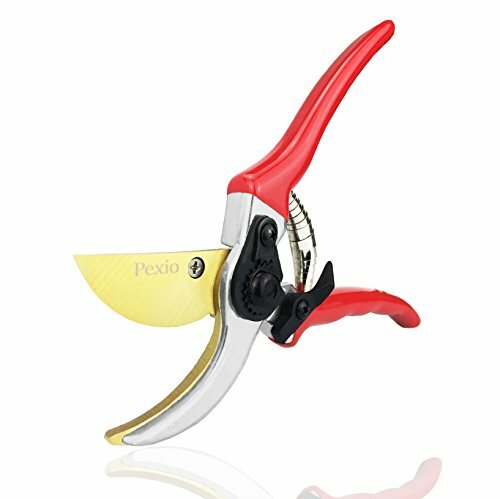 The Pexio Premium Titanium Bypass Pruning Shears is a fantastic and must have gardening equipment that not only is made out of high-quality materials but is also very easy on the pocket. This pruner will cut through small branches and plants with absolute ease, and you will be glad that you have this as a part of your gardening arsenal. We highly suggest choosing the Pexio Premium Titanium Bypass Pruning Shears if you are on a tight budget but yet require something that is long-lasting. This pair of pruning shears is extremely light in weight, making it comfortable to use and most important of all, it is highly durable, making it a fine purchase.